PRODUCT: #9-15 X 3 HWH WOODMAC SMS, SHARP POINT, STAINLESS CAP HEAD, CUPPED, W/SEALING WASHER (250), WOODMAC #C0488-CAF. 250/BAG. Price/BAG. 1/4" Cupped head stainless steel capped head. 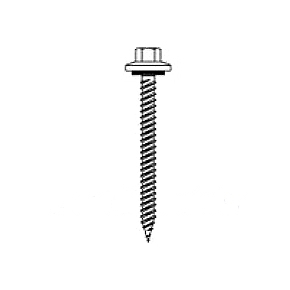 Fasteners do not require a pre-drilled hole when attaching 26 and 24 gage metal to wood.